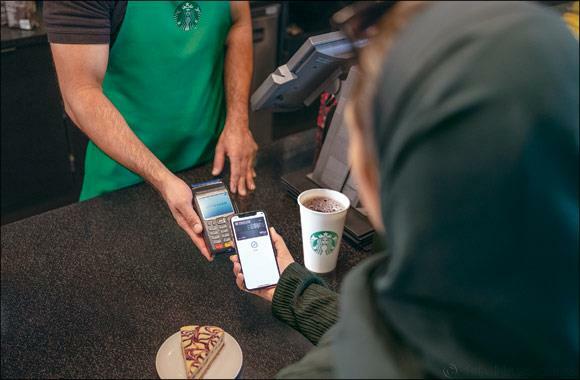 17 March 2019: Visa (NYSE:V), the world's leader in digital payments, today announced partnerships with Starbucks and Hardee's to accelerate the use and adoption of Apple Pay in the Kingdom of Saudi Arabia and United Arab Emirates. With Apple Pay, Visa cardholders and iPhone users can make instant payments using their phone via app or on web. As part of Visa's partnership with Starbucks, the world leading coffee chain and Hardee's, one of the world's most popular food and beverage service chains, Visa cardholders will get free upsize/upgrades on their orders when paying with Apple Pay. The promotion with Starbucks will allow Visa cardholders to upgrade the size of their Latte, Cappuccino, or Americano beverages if they pay through Apple Pay. The offer is applicable across all Starbucks outlets (excluding airport stores) in the Kingdom and UAE and is valid for up to four weeks starting March 13, 2019. The Hardee's promotion will allow Visa cardholders to receive a free dessert when they buy any large meal of their choice using Visa with Apple Pay. This offer is applicable at Apple Pay enabled Hardee's stores throughout the Kingdom and will be valid through June 9, 2019. Commenting on the promotion, Kalika Tripathi, Visa's Head of Marketing for MENA, said: 'Visa is delighted to partner with Starbucks and Hardee's to bring this upsize offer to our cardholders and Apple Pay. Considering Saudi Arabia and the UAE's young and digitally savvy populations, it is almost certain that mobile payments and digital wallets will increasingly integrate into consumers' daily lives and steadily become the most preferred mode of payment. At Visa, we want to ensure our cardholders have access to superior payment experiences that tick all the boxes when it comes to their expectations, and that include being seamless, quick, convenient and secure. With Apple Pay, Visa cardholders across the Kingdom and UAE can make payments directly from their Apple devices while Visa's tokenization security ensure that their financial details remain protected and secure. Commenting on the co-promotion, Rana Shaheen, Regional communications and CSR Manager, said: 'Starbucks is not just a passionate purveyor of coffee, but everything else that goes with a full coffeehouse experience. We are excited to partner with Visa to bring a convenient payment method to our customers in KSA and UAE. Our customers can now enjoy a complementary upsizing on their favorite beverages when paying through Apple Pay. This additional service complements the third-place experience at Starbucks, a place between home and work offering the usual coffee house experience our customers are used to have. Commenting on the promotion, Glen Helton, CEO of Americana Restaurants Division, the operators of Hardee's in the region, said: 'We are delighted to partner with Visa to offer our customers the opportunity to enjoy a free dessert when they buy any large meal of their choice using Visa with Apple Pay. As a quick-service-restaurant, we always strive to serve our customers the best quality burgers as swiftly as possible. By accepting payments via Apple Pay, we can significantly reduce the checkout queue and ensure that our customers receive both an enhanced payment experience and the best burger meals. Online shopping in apps and on websites accepting Apple Pay is as simple as the touch of a finger with Face ID, so there's no need to manually fill out lengthy account forms or repeatedly type in shipping and billing information. When paying for goods and services on-the-go in apps or Safari, Apple Pay works with iPhone 6 and later, iPhone SE, iPad Pro, iPad Air 2, and iPad mini 3 and later. You can also use Apple Pay in Safari on any Mac introduced in or after 2012 running macOS Sierra and confirm the payment with iPhone 6 or later or Apple Watch, or with Touch ID on the new MacBook Pro or later.